On two chilly December days in 1763, bands of armed men raged through camps of peaceful Conestoga Indians. They killed twenty women, children and men, effectively wiping out the tribe. These murderous rampages by Lancaster County's Paxton Boys were the culminating tragedies in a series of traded atrocities between European settlers and native tribes. 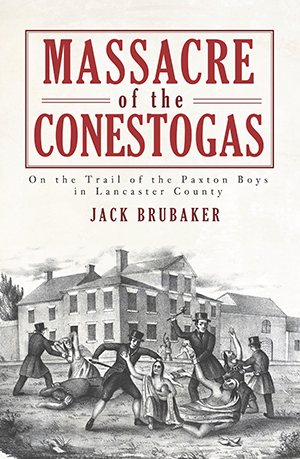 Lancaster journalist Jack Brubaker gives a blow-by-blow account of the massacres, examines their aftermath and investigates how the Paxton Boys got away with murder. Join Brubaker as he follows the bloody trail left by the killers through the Pennsylvania countryside. Jack Brubaker is a columnist and investigative reporter for Lancaster Newspapers. He has written six historical books, including Remembering Lancaster County, published by The History Press earlier this year. He lives with his wife, Christine, in Lancaster County's Manor Township, not far from where the Paxton Boys massacred the Conestoga Indians nearly 250 years ago.